When she was 13, Surbhi was a patient. It was then that she realized she wanted to fill the void in female-health related innovation. She attended UC Berkeley and then worked as an engineer, first at Abbott Vascular and then at early stage companies. Finally, she decided to tackle some of the issues she witnessed in women’s health and is now CEO and founder of nVision Medical. nVision is developing products related to infertility and ovarian cancer and secured $4.5M in a venture-led round. 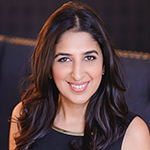 Surbhi has authored numerous patents, been an invited speaker at universities including UCSF and Harvard, and has been featured in publications such as Bloomberg, Entrepreneur Magazine and GigaOm. She was named on the Forbes 30 under 30 list for 2014.